California's lawmakers and courts have shown repeatedly that they couldn't care less what voters want. They routinely overrule the will of the people, and they'll do so again at the behest of the 800 lb gorilla in Cupertino. Another fake, token gesture by the turds in the toilet. The only thing dirtier than East Coast corruption is that scar on the West Coast, about halfway down. If you're gunna charge me over a grand for your phone, I expect to be able to repair it when the warranty runs out. Wow, they try to pass a good law and, can you believe it? Partisan politics is at it again! Let's all hate California for being California even if it means giving up our rights as consumers! I own and repair a 40 year old dryer, a 35 year old washing machine, a 28 year old dishwashing machine, a 26 year old station wagon and various stoves, ovens, refrigerators, toasters, computers, clocks, etc. I did buy a 700 watt microwave last year when the magnetron on my 30 year old LG died. Over the years I have saved well over $10k net - and much more if I had replaced rather than repaired. I recommend 'repair' as a hobby to anyone so inclined. 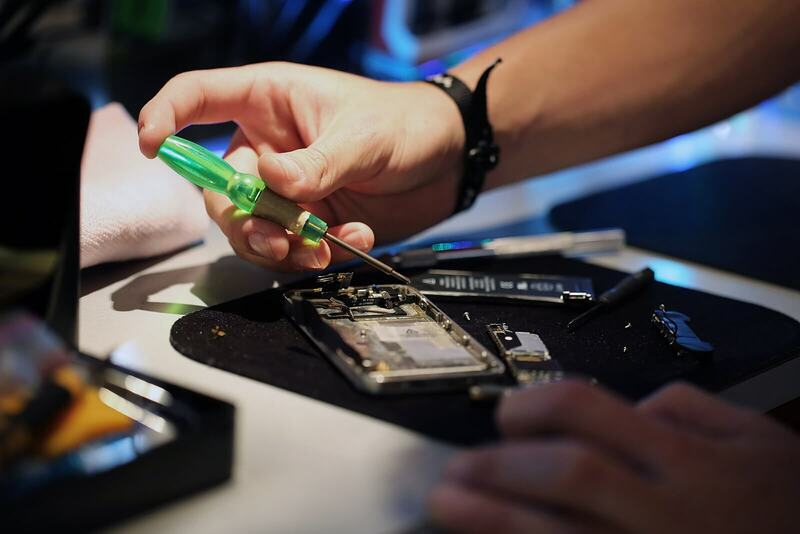 Does it need a 'right to repair' law? Nice idea, but in some cases anti-competitive. If a durable micro-sized product with good recycling characteristics could be made, should we deny it with a 'replaceable battery' requirement? 'Fixit' is great. I'm a believer - but only to the extent that 'repair-ability' is assessed and reported - not that it should be required. We should let 'sunshine' and the market handle this. You should have the opportunity to buy and use (if only for a short while) a smartphone with an epoxied battery for $1,000 if you so choose. Me, I'll stick with the replaceable battery model for a quarter of the price. All lawmakers have overruled the will of the people before, and will keep doing so. This isn't exclusive to California. Good legislation is irrelevant if it doesn't pass and become law. That's the point here. There is no faith that this legislation is actually being made in good faith. It'll take being passed and in a form that actually helps consumers repair before people are going to give any kudos out for this. They aren't asking for kudos, they are making the public aware so they can press politicians in their state to vote for this. And what you said has nothing to do with the above posts hating on this legislation simply because it is in California. The above posts are dumb as hell because they are willingly fighting against their own consumer best interests "because California". It's like conservatives fighting against Obamacare because Obama. Meanwhile, universal healthcare has it's roots in the Regan administration. It was originally a republican idea. Same with the EPA, which Regan created and conservatives now hate it for some reason. Being partisan for the sole purpose of being partisan is the dumbest thing in the world. And I'm not just hating on Republicans, democrates do the exact same thing. If not even more so.
? this makes no sense. you can repair items out of warranty anytime you want, the manufacturer is taking no responsibility for the repairs. They typically have certified repair shops that can do it, and sometimes you can get cheap aftermarket stuff to repair, but it is at your own risk. The real intent of the law here is to have reasonably priced components available for repairs. I had to get an AC repaired, the cost of the control board was $400, for a $15-30 part. The same goes for phones and such. The broader issue is what happens when your uncertified repair gets screwed up, and who does the blame fall to. Many modern products like the surface pros use a lot of glue to hold things together, this is not a user-serviceable issue stripping and then re-applying glue. If I wanted my device to be repaired, I would want someone competent to do it. Then there is the issue of security. If anyone could open a device, strip out parts and go off and running. Well, there goes your identity, your cash, your credit. So some level of restriction is clearly warranted. What level? The issue of user-serviceable items is more relevant. Batteries die! While I don't think $69 to replace a battery by a certified shop is outrageous, some do. Many think that batteries, and storage should be user-upgradeable. Ram is on the chip, so forget that. Who knows how this effects weight and size and thermal loading. While I haven't read this legislature, these legislature have also included clauses requiring OEMs to provide parts at reasonable cost to the consumers so that they can repair their purchased product on their own. I'm all for it since OEMs have refused to provide access to those parts to both customers and small mom and pop repair shops. The problem is that in this day and age, a lot of phones are waterproof and involves lots of glue. To repair those phones, you need the use of a hot plate or some sort of oven to loosen the glue. GregonMaui is totally right on items that are not user-serviceable because of these glue situations (whether for surface devices or for cell phones). Let's see if Kyle at iFixit can help get this bill passed. Ahh yes, democracy in action! And what you said has nothing to do with the above posts hating on this legislation simply because it is in California. No one here is hating on the right to repair legislation. This is your fabrication. Nothing in the posts quoted or above yours have anything to do with showing support against the legislation. So I have to question, just what in the world are you referring to? I quoted them in my first post. Are you reading something different than I am? That is most certainly partisan behavior. Whether they are hating on california, the legislation, idk. All I see is blind hate towards California and it's law makers and by proxy, it's legislation.